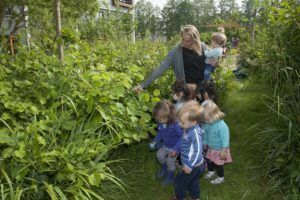 What makes KDV Kindercampus Zuidas so special? There’s much focus on creative and encouraging activities at day-care centre Children’s Campus Zuidas. These include toddler dance with topics such as the seasons, traditional celebrations or more specific topics such as traffic or animals. Your child will be offered dance, movement and music classes by a dance teacher or musician on a weekly basis. Zuidas Children’s Campus nursery has four vertical groups for ages nought to four years. If your child has a place in the Zuidas Children’s Campus nursery and you plan to send them to the campus primary school, please register early. It is not arranged automatically and registration is no guarantee of a place. You also need to register your child separately for the Zuidas Children’s Campus After School Care (BSO). Registration does, in this case, guarantee a place.